Alderflies are typically mistaken for small hellgrammites as larvae and large caddisflies as adults. They turn up often enough in nymph samples that it's nice to know what they look like. There are rumors of their occasional importance to trout, but the average anglers is not likely to encounter it. Pupae burrow into the ground near to, but not in, the stream. Because the emergence takes place on land it is unimportant to trout. The mating adults gather over the water in good numbers but do not usually fall into the water unless wind knocks them off course. The egg masses are deposited on rocks, limbs, leaves and bridges where they are over running water and in the sunlight. They are placed so that the hatching larvae fall into the stream. 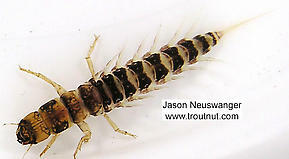 The larvae are burrowers like the Ephemeridae mayfly nymphs, digging down into the silt. Brigham, W.U., A.K. Brigham, and A. Gnilke. 1982. Aquatic Insects and Oligochaetes of North and South Carolina. Midwest Aquatic Entomologist.